Developed from the Model 30 (third prototype configuration), the Bell Model 47 was ordered for the US Army and Navy towards the end of World War II and first flew in 1945. 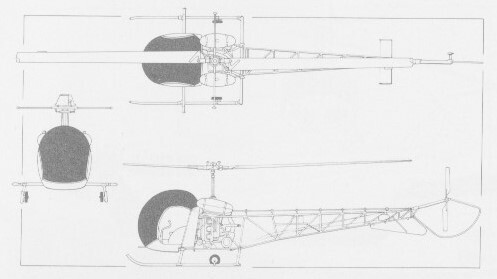 The pre-production model had a 178 hp Franklin engine driving a two-blade wooden main rotor, two side-by-side seats, open cockpit (but later removable transparent bubble), four-leg wheel u/c, open frame rear fuselage with tail skid (later tubular tail rotor protector), ventral fin and and a car-type. The prototype (NC41962/NC1H) first flew on 8 December 1945. Only ten were built. On 8 March 1946 this was awarded the first Approved Type Certificate issued for a civil helicopter anywhere in the world. Licensed by the Federal Government and manufactured under Helicopter Type Certificate One. The A and B models used the enclosed body. In 1947 the USAAF procured 28 of the improved Model 47A, powered by 117kW (157-hp) Franklin O-335-1 piston engines, for service evaluation: 15 were designated YR-13, three YR-13As were winterised for cold-weather trials in Alaska, and the balance of 10 went to the US Navy for evaluation as HTL-1 trainers. Little time was lost by either service in deciding that the Model 47 was an excellent machine, and the orders began to flow in. The US Army's first order was issued in 1948, 65 being accepted under the designation H-13B; all US Army versions were later named Sioux. Fifteen of these were converted in 1952 to carry external stretchers, with the designation H-13C. Two-seat H-13Ds with skid landing gear, stretcher carriers, and Franklin O-335-5 engines followed, and generally similar three-seat dual control H-13Es. The H-13G differed by introducing a small elevator, and the H-13H introduced the 186kW Lycoming VO-435 engine. Some of the H-13Hs were used also by the USAF, as were two H-13Js with 179kW Lycoming VO-435s acquired for the use of the US President. Two H-13Hs converted for trial purposes, with an increased-diameter rotor and 168kW Franklin 6VS-335 engine, were designated H-13K. In 1962 US Army H-13E, -G, -H and -K aircraft were redesignated with the prefix letter O, for observation. US Air Force H-13Hs and H-13Js were given the U prefix as utility helicopters. Later acquisitions were the three-seat OH-13S to supersede the OH-13H, and the TH-13T two-seat instrument trainer. US Navy procurement began with 12 HTL-2s and nine HTL-3s, but the first major version was the HTL-4, followed by the HTL-5 with an O-335-5 engine. HTL-6 trainers incorporated the small movable elevator. The HUL-1 was acquired for service on board ice-breaking ships, and the final HTL-7 version for the US Navy was a two-seat dual-control instrument trainer with all-weather instrumentation. In 1962 the HTL-4, HTL-6, HTL-7 and HUL-1 were redesignated respectively TH-13L, TH-13M, TH-13N and UH-13P. The 47B-3, a utility and agricultural model, had an open sports-car style body and it was from this design that the goldfish bowl moulded canopy was derived. In parallel with production of military aircraft, by both Bell and its licencees, there were civil versions for a wide variety of purposes. These have included the Model 47B (equivalent to the military YR-13/HTL-1), and the agricultural/utility Model 47B-3 with open crew positions. Available in 1948, this model was the crop-dusting variant featuring a fully open cockpit and bins were affixed aft of the cabin and could carry 180kg of dust. The 47B was powered by a vertically mounted 175hp Franklin 6ALV-335 six-cylinder engine. The enclosed cabin, seating two side-by-side, featured two car-like doors. A total of 78 Model 47Bs (including 47B-3) were produced. Two Bell 47B-3’s used by B.E.A. had plexiglass cabin, covered fuselage, and 178 hp Franklin 6V4-178-B32 engines. Early in 1948, the Model 47B was superseded by the Model 47D (FAA certified in February 1948) which incorporated improvements, including the plastic bubble-like cabin, the top of which could be removed to provide an open cockpit. 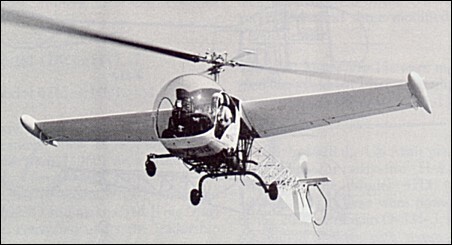 In 1949, a new sub-variant appeared, the Model 47D-1 utility helicopter with an openwork tail boom capable of carrying three people or 225kg of payload. The same year, Bell helicopters began to be used on air mail services in Chicago and a Bell 47 set a new altitude record with 5654m as well as a new speed record with 215.45km/h. In 1950, a Bell 47D-1 became the first helicopter to fly over the Alps, and in Belgium the first European postal service by helicopter was set up by Sabena on 21 August, 1950. At the end of the same year, Bell 47s were used to take precise measurements over the Niagara Falls. 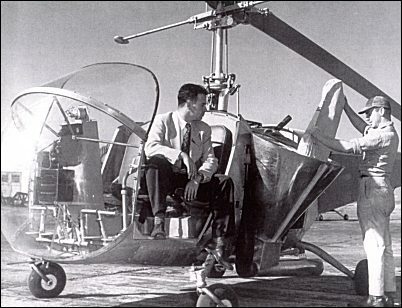 On 17 September, 1952, Bell pilot, Eiton J. Smith set the world's straight line distance record for helicopters without payload (Class-E) at the controls of a Model 47D-1 registered N167B, flying nonstop from Hurst (Texas) to Buffalo (New York): 1958.37km in 12hr 57min. On 2 September, 1956, at the National Aircraft Show in Oklahoma City, an H-13H flown by an Army pilot stayed in the air for 57hr and 50min, an unofficial world's record. The introduction of the Model 47G (granted an FAA certificate in 1953) combined the three-seat capacity of the Model 47D-1 with a 149kW Franklin engine which, through a two-stage planetary transmission system, drove a main rotor of laminated wooden blades with steel leading edges, a tail rotor and a cooling fan. 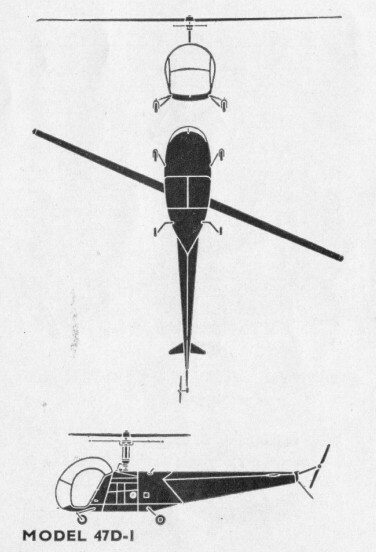 This helicopter had a synchronized elevator directly linked to the cyclic pitch control lever, an improvement which gave better stability and an increased margin of centre-of-gravity travel. The landing gear consisted of two skis 2.88 metres apart, and, if needed, quick-change flotation gear could be fitted. In the former case, two small wheels assisted handling on the ground. The service designations were H-13G in the United States Air Force, HTL-6 in the United States Navy. The designation 47G-1 is that given to the prototype of the 47J equipped with a Lycoming 250hp derated engine. A Bell 47G-2 landed on the summit of Mt.Blanc (15,770 ft) with two occupants. Substitution of the similarly powered Avco Lycoming VO-435 resulted in the Model 47G-2 (H-13H). A 179kW VO-435 engine brought the changed designation Model 47G-2A, followed in 1963 by the wider cabin Model 47G-2A-1 with improved rotor blades and increased fuel capacity. Other engine installations included a 168kW supercharged Franklin 6VS-335-A (Model 47G-3); 209kW turbocharged Avco Lycoming TVO-435 (47G-3B); and normally aspirated Avco Lycoming VO-540 and VO-435 engines in the three-seat utility Model 47G-4 and Model 47G-5 re spectively. A two-seat agricultural version of the latter was known as the Ag-5, and a civil version of the USAF's H-13J VIP transport was marketed as the Model 47G-4 and Model 47G-5 respectively. The Model 47G-2 registered N6723D and nicknamed "Wing Ding" was converted under the leadership of Jan Drees and flown by Floyd Carlson and Lou Hartwig in 1963. The purpose of the Wing Ding programme was to develop an aircraft which would lift very large payloads in excess of its hover capability, taking advantage of running take-offs and landings. In addition to the wing the rotor's mast angle could be varied in flight. Introduced in 1955, the Model 47H was a deluxe version of the Model 47G. It had an enclosed sound-proofed, 3 seat cabin. The cabin had leather upholstery throughout as well as a leather covered dashboard grouping all electrical switches and carburettor controls. The metal monocoque tail boom contained a luggage compartment. The cabin's width has been increased to 1.52 metres, so that motor vehicle-size seats can be used. With a 200hp engine, the Bell 47H was not a commercial success. First proposed in 1956, the Model 47J was a four-seat utility version of the Model 47G civil version of the USAF's H-13J VIP transport, powered by a 220hp derated Lycoming VO-435. The enclosed cabin sat the pilot centrally in front and three passengers on a cross bench behind. This bench could be removed to allow the installation of two stretchers. The left door could also be removed for an internal electrically-powered hoist. Alternative skid or pontoon landing gear could be fitted and metal rotor blades were optional permitting a loaded weight of 1290kg. Larger capacity fuel tanks (182 litres) could also be installed providing an extended range of 400km. All the mechanical parts were the same as in the 47G-2. The soldered-tube tail is replaced in the 47J by a monocoque beam. The central section was still made of tubes, but was streamlined. This model was also built under licence by Agusta with 152 aircraft built. - Model 47J-1 - this sub-variant was similar to the Model 47J but was powererd by a Lycoming VO-435A. - Model 47J-2 and J-2A "Ranger" - introduced in 1960, this sub-variant was similar to Model 47J but had a 305hp (derated to 240hp) Lycoming VO-540-B1B, metal rotor blades, hydraulic power controls and a gross weight of 1290kg. The Model 47J-2A of 1964 was produced in Italy by Agusta. - Model 47J-3 "Super Ranger" - this variant, produced by Agusta, was powered by a Lycoming VO-540 derated to 260hp. It differed from the standard J-2A in having a modified main transmission able to absorb greater power input. A special ASW version was designed for the Italian Navy with new instrumentation, high efficiency rotor brake and armed with a single Mk.44 torpedo. - Model 47J-3B-1 - this sub-variant produced by Agusta was a high-altitude version powered by a 270hp Lycoming TVO-435-B1A and equipped with an exhaust-driven supercharger which maintained sea level conditions up to 4260m. This model also had a high-inertia rotor and servo-control on the pitch control systems. 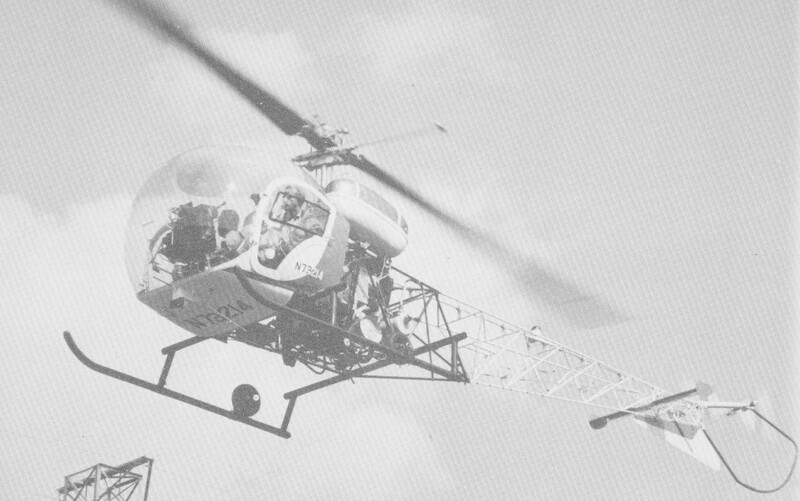 The 1959 version of the Bell 47J Ranger had a modified tail-rotor control to simplify maintenance. Larger drag-links are required for the metal blades of the main rotor. B 1959, over 2000 Bell 47s had been built. The 47J "Ranger" is the first helicopter to have crossed the Andes by way of the Christo Paso. This flight was made at a height of 5180m, with a total weight of approximately 68kg below the helicopter's own maximum gross weight. HUL-1 is the U.S. Navy designation. Experimental versions have been numerous. Perhaps the two most im-portant were the turbine Bell Model 201 (service designation XH-13F) and the armed Bell Model 207 Sioux Scout. Bell's production of Model 47s eventually came to an end in late 1973, versions of the Model 47G-5 being the last to be built. 4,018 were built in 24 different basic configurations. Of the many different models built only two of the commercial ver-sions, the Bell 47G-2 and the Bell 47G-3B-l, had production runs in excess of 300 (334 and 337 respectively). 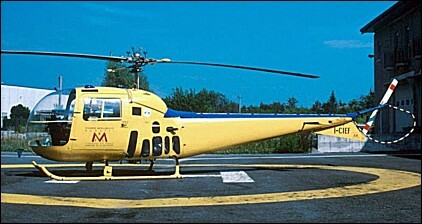 In 1952 Agusta SpA of Italy was granted a licence to build the Bell 47 and produced its first 47G in 1954. Since then Agusta has built over 1000 G (from 1954 to 1976) and J marks. Agusta produced a three-seat version as the EMA 124. The Agusta-Meridionali EMA.124 Bell 47 derivative had three-seats, an open frame rear fuselage, skid u/c and one 305hp Textron Lycoming VO-540-B1B3 piston engine. Intended for production by Elicotteri Meridionali SpA, one prototype, I-EMAF, was built, first flown on 28 May 1970. Kawasaki in Japan received a licence in 1953, and the Kawasaki-Bell 47G3B-KH-4 first flew as a type in 1962. Being a development of the Bell 47 by Kawasaki, the type features a four seat cabin layout, modified instrument and control systems, and a 260 hp Lycoming. The Model 47 was built under licence by Westland in the UK (the 47G-2 for the British Army) with the name Sioux. agricultural aircraft developed by Continental Copters Inc. Turboshaft conversions of several models have been produced by Soloy in the USA. Three YH-13 modified for cold weather operations. Two-seat commercial Model 47 with enclosed tailboom, fully enclosed fuselage with stepped windshield, under-nose transparencies and two car-type doors, four-leg u/c. Prot NX41967. Model 47 for crop dusting with modified open cockpit, engine compartment fairing, and externally mounted dusting hoppers. 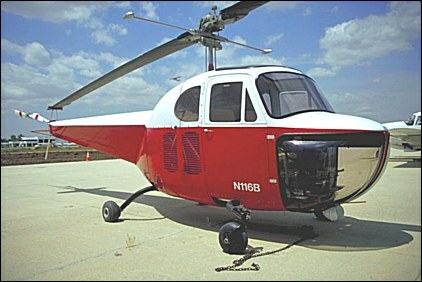 Model 47B-3 with improved plexiglass, bubble canopy, new wheel installation with brakes, 24 volt electrical system, modified fuel system, optional float u/c (47D-S) and 178hp Franklin 6V4-178-B32 engine. 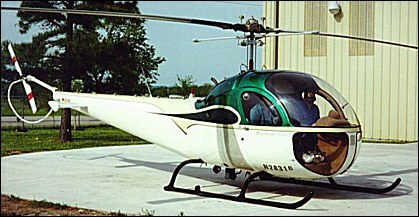 Military model similar to civil 47D with four-leg u/c, bubble canopy with removable top, covered rear fuselage and dual controls. 61 built. H-13B with uncovered rear fuselage and skid u/c with external medevac litter fittings. 16 built. H-13C with single pilot controls. 88 built. Rotor dia. : 35 ft. 11 in. H-13D with dual controls, modified main and tail gearboxes and main transmission. 49 built. Three-seat Model 47D with open frame fuselage, new canopy, gravity-feed fuel system, ventral fin, roller-bearing transmission, 29-USG fuel capacity, reduced equipment and increased useful load. 937kg TOGW. US Navy version of Model 47D-1. Later TH-13L. 46 built. HTL-4 with 200hp Franklin O-335-5 engine. Two-seat Model 47D with 200hp Franklin 6V4-200-C32 engine, 1060kg TOGW, 33-USG fuel capacity, optional open cockpit. Three-seat Model 47D with 200hp Franklin 6V4-200-C32AB engine, skid u/c, small tailplane with endplates, relocated battery, revised tail rotor gearbox, synchronised elevator and relocated 43-USG 'saddle' fuel tanks 1060kg TOGW. Model 47G with 200hp Lycoming VO435-A1A engine, relocated cyclic hydraulic boost controls, bonded metal rotor blades and 1105kg TOGW. Also built by Kawasaki. US Navy dual control training version of H-13G. Later TH-13M. Military model similar to 47G-2 with increased fuel and external stretcher fittings. 265 built. H-13G with 250hp Lycoming VO-435-23 engine, improved skid u/c and all-metal bonded rotor blades. 468 built. Three-seat Model 47G with 240hp Lycoming VO-435-A1E engine, 1285kg TOGW. Also Kawasaki model. 47G-2A with fuel capacity inc. from 43-USG to 61.6-USG. Civil and military model 47G with 225hp Franklin 6VS-335-A engine, longer rotor blades and 14-inch longer tailboom. 1195kg TOGW. Civil and military Model 47G-3 with turbocharged 260hp Lycoming TVO-435-A1A and 1285kg TOGW. 576 built. Model 47G-3B with 270hp turbocharged Lycoming TVO-435-B1A engine, 8-inch wider 3-seat cabin, 61.6-USG fuel capacity. 1330kg TOGW. Built also by Westland and Agusta. Model 47G-3B1 with turbocharged 280hp Lycoming TVO-435-G1A. 1330kg TOGW. Two/three seat military instrument trainer with extra IFR equipment. 417 built. Model 47G with 260hp Lycoming VO-540-B1 B3 engine, 61.6-USG fuel, hydraulically assisted controls and 1330kg TOGW. Model 47G-4 with engine uprated to 280hp. Economy 2-seat version of 47G-4 with 12 volt electrical system. 1285kg TOGW, 28-USG fuel capacity. Can be upgraded to 3-seat configuration with synchronised elevator mod. 3-seat Model 47G-5 with 61.6-USG fuel tanks and 11-inch wider cabin. Main rotor disc area: 100.61 sq.m (1,083 sq ft). Rotor diameter: 35 ft. 1.5 in. Max. speed: over 100 m.p.h. Typical range: over 200 miles at 95 mph with full load. Model 47G with fully clad fuselage, wider three-seat deluxe cabin and rear baggage stowage locker, contoured 35-USG fuel tanks, modified skid u/c. 1060kg TOGW. Four-seat development of Model 47H with single pilot seat and rear 3-place passenger seat. Powered by one 220hp Lycoming VO-435-A1B, 1157kg TOGW and 35-USG fuel capacity. Model 47J for USAF with 240hp Lycoming VO-435-21. Model 47J for US Navy with 260hp Lycoming VO-435-B1B. Later UH-13P. Also HUL-1G (HH-13Q) for USCG. 25 built. Model 47J with VO-435A engine. Model 47J with 240hp VO-540-B IB engine, metal rotor blades, fixed stabiliser, hydraulic controls, blue tinted bubble and windows, 48-USG fuel capacity and 1285kg TOGW. Model 47J-2 with 260hp Lycoming VO-540-B 1 B3 engine, collective boost system and 1330kg TOGW. Built by Agusta. Naval Model 47J-2A with strengthened transmission, improved rotor brake and underslung torpedo. Agusta built. Model 47J with turbocharged Lycoming TVO-435-B1A engine for high altitude operation and modified servo control system 1330kg TOGW. US Navy 2-seat trainer based on HUL-1 with modified cockpit and IFR instrumentation. 240hp Lycoming O-435-6 engine. 1157kg TOGW, 35-USG fuel capacity. Later TH-13N. 18 built. Experimental Model 47J with 250shp Allison YT-63-A-3 turboshaft and 1285kg TOGW. First a/c Bu. 149838 FF 6 Jan, 1961. Later UH-13R. 2 built. Agricultural conversion by Continental Copters with single seat cockpit and two large external hoppers plus underslung spray bars.